Dr. Tarun Kumar Giroti, the founder and CEO at The Sterling Dental Clinic established the clinic in the year 2001. An alumnus of KLE’s Dental College, Belgaum, is a masters in Endodontics and Conservative Dentistry. 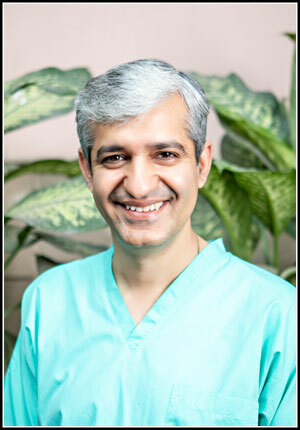 With 20 years of practice, Dr. Tarun without a doubt, is the best endodontist in Delhi. He has been an extremely valuable member of various dental teams at Escorts Heart Institute, Sant Parmanand Hospital and Apollo clinic doing some amazing ground-breaking work in the dental field. For the last several years he has been running a high successful dental practice in Delhi’s premium locality of Vasant Vihar. Dr. Tarun, a highly decorated member of the dental fraternity is a Member of the Royal Society of Medicine. He is a most sought-after international speaker on various subjects and topics. He has many publications under his belt. Dr. Tarun has taken up various advanced courses in USA, Japan, Israel and Sweden to ensure world class treatment for his patients. He treats every aspect of dentistry including Periodontics, Restorative, Prosthodontics, Pedodontics, Implantology and Oral Surgery. However, Endodontics is particularly closest to his heart. His positivity and affable chairside manners stem not only from his experience of over two decades but also his spirituality that motivates him to serve his patients with the best care possible. Dr. Tarun has only one primary goal for himself and his team— the patient’s utmost comfort. For your dental health, do your best and leave the rest to us!